This is my first post of the year 2012, it's Dragon year! I was born in Dragon year and so was my husband. Hopefully this means we will have a fantastic year! What do I do with the left over alcohol from all that holiday parties? Sure I can save it for cooking but how many bottles do I need for cooking, especially champagne?! By now you probably already guessed what I'm about to show you. Yes, of course, if not soap then what? I called this Champagne Pear. It is made with left over Brut and scented with my own mix of pear fragrance oil. I boiled the brut the night before to flatten the 'gas' then used that as my whole water amount to dissolve the lye. Oh you should see the bubbling action when it hit the lye beads, it's like champagne all over again! And, it stinks! The lye champagne turned into red-ish color. That made me worried, I had all my colors planned out! My quick save is adding titanium dioxide and it worked. Let's start the year with new do from last year's left over! 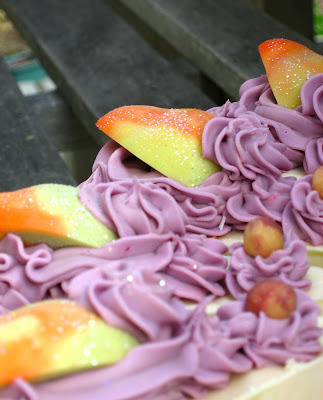 DO you see the 'frosting' on the pear slice? That's caused by insulating the soap after pour, and the melt & pour soap pear slice absorbed some moisture in the insulated space. Actually, I love that accidental effect! Can you believe a day ago the purple icing actually looked latte brown? Wow ... your soap looks amazing! 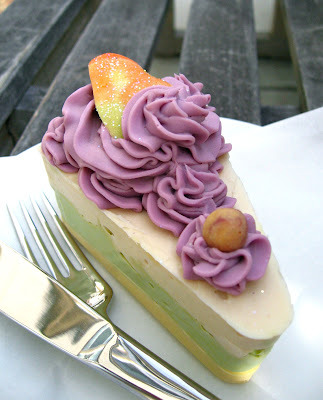 I love the mould, that would be great to have, so you don't have to cut the cake into slices! Bet it smells fab too! God that is brilliant!!! How did you ice the cake? Is it just a thick batter and you worked really quickly? I love it, the pears look amazing too (I wondered if they were CP or not cos they look like it).... brilliant work!!! Wowzers Emily! That is some start for the new year!!! It looks stunning- lots of work I bet! 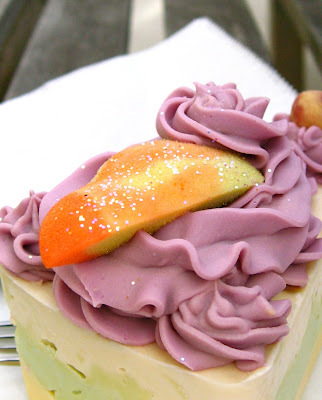 The pears look so realistic and the frosting is to die for! I guess it is heavily traced soap piped isn't it? Fab job! That is so smart to use a cake already in slices! I want to try a soap cake but, I can barely cut soaps bars so I know that won't be pretty! Your slices look so pretty!Great idea with the champagne, I don't drink so I have none. wowwwww ...incredible !!! It's amazing !!! Incredibly beautiful, could not stand to use it, too pretty! You are amazing. I am thinking birthday cake and mother's day!! @ Celine & Hajni, yes, it's heavy traced soap pipped on the cake, you 2 should try it sometimes, very fun! The pear slices are M&P. Thanks everyone! I do like to play with new molds, this one is a great find, if you are interested, go get it from amazon, very reasonable priced! 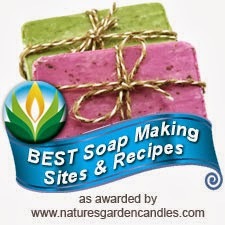 What beautiful soap you make!! Absolutely fabulous. What a beautifully colored and constructed soap. The fragrance sounds lovely and I imagine with all the Champagne it bubbles so to speak. I love your soap. I made soap form red wine left over from Christmas. @ Amy, >_< about the business manager... My husband got a MBA and he's my worst help! He's very boot camp style, got me all stressed out about $... sigh. @ Miranda, oh yeah, my Pinot one is coming up next! Absoultly gorgeous! You are very creative. This is absolutely terrific! Here's to you!!!! I love anything creative! They say left brain controls logic and right brain goes for creativity, I guess I'm more of a right brain gal! My full time job is consuming most of my time exercising my left brain. This is just an outlet for my restless right brain to vent.